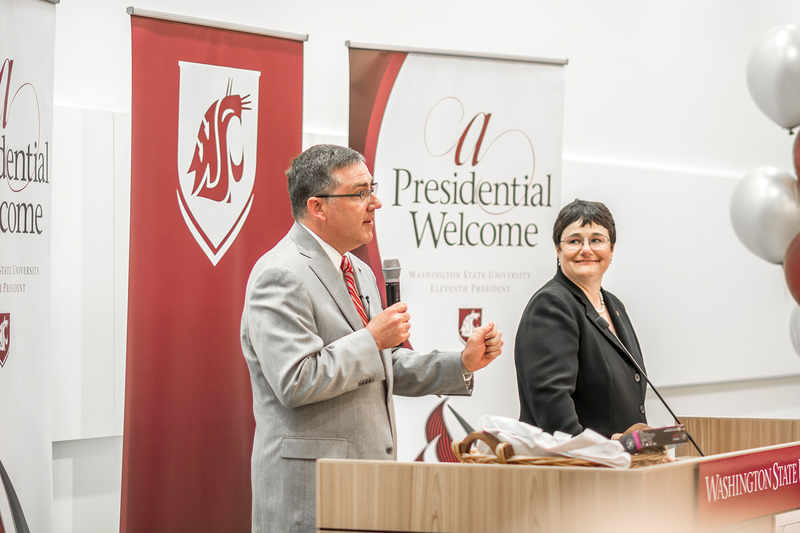 Q: President Schulz, you’ve been to Spokane several times since starting at WSU in June. What is your perception of the community? KS: Spokane is a tremendous, vibrant community. I totally understand why it’s an All-America City. Washington State University has enjoyed a productive partnership with Spokane for decades, and we look forward to building on that relationship in the years ahead—contributing to the growth of the economy and the quality of life. KS: The University District as a whole is a community jewel—not just for Spokane but also for the entire Inland Northwest. With the creative thinkers from the district’s colleges and universities, health care entities, and local startups and existing companies working together, I think we’re just beginning to tap into the possibilities for innovation success. And, of course, the resources Washington State University has in place in Spokane are fantastic, well-equipped facilities and world-class faculty in the health sciences and other disciplines who are involved in exciting research and educating some really incredible students. And we’re working hard to bring our expertise to the community in practical ways—ranging from health care and K-12 education to economic development and extension services. Q: You’ve said that one of the reasons you came to WSU was its pursuit of medical school accreditation. Please elaborate on that. KS: It’s not often that an incoming president at a major university has the opportunity to get in on the ground floor of building a medical school. That really intrigued me. And because I’m a big believer in the land-grant mission of providing access to higher education, I was happy to learn that providing more seats to prospective medical students and improving access to health care were two of the primary reasons the medical school initiative was launched. Q: How do you see the medical school affecting the Spokane campus? WSU as a whole? KS: The medical school and the spinoff results in the community will be a boon to the Spokane and regional economies and enhance the area’s livability in ways we can only begin to imagine. From an economic standpoint alone, I know there are projections indicating a fully established health sciences-focused enterprise in Spokane could create more than 9,000 new jobs and $1.7 billion in annual economic impact for the region’s health and life sciences industry. From a university perspective, a medical school opens up a lot of doors. We’ll see new research funding opportunities—many of them multidisciplinary in nature. A medical school really ramps up the possibilities in addressing our Grand Challenges research initiative focused on sustaining health. And there’s no doubt that adding a medical school to Washington State University’s portfolio enhances our overall reputation—which benefits student recruitment, fundraising, and our community partnership-building opportunities. Bottom line, a medical school benefits all the residents of our state. Q: Your goal to have WSU recognized as one of the nation’s top 25 public research universities by 2030 is impressive. What role do you see for research in Spokane? KS: There’s no doubt that the Spokane campus will play a leading role in the “Drive to 25.” The cutting-edge health sciences research occurring in Spokane will be a key to the success of our initiative. But it’s about more than research. As an example, our interprofessional education approach to the health professions—where students studying different health disciplines learn together—transforms the educational experience for these students, and it eventually transforms the health care experience for their patients. Q: You’ve said university research needs to benefit the state’s economy. Where is WSU particularly strong in turning research into commercialization? Do you have particular expectations for the Spokane campus? KS: Washington State is just beginning to tap into our enormous potential for moving research from the lab into the marketplace. In the past five years, WSU’s invention disclosures have almost doubled, and our royalty revenues have more than doubled to $1.2 million in 2015. The Spokane campus has the potential to be a major contributor to our commercialization efforts in health-related fields. Q: Are there any areas of health sciences research that you would like to see the Spokane campus pursue? KS: We have an amazing portfolio of research underway in the fields of nursing and pharmacy already, and our efforts in medicine are growing and will continue to grow as the medical college becomes established. My goal is to help those efforts continue to evolve, continue to become more multidisciplinary, and continue to link with the experts on our other campuses and with community partners across Washington as we build this statewide health sciences enterprise. Q: Your tweets indicate you enjoy eating out and shopping in Spokane. Are there particular restaurants and stores you enjoy the most? KS: The upside to being new is that you are always in discovery mode. Noel and I love exploring the variety of Pacific Northwest cuisine available in Spokane. The emphasis on locally sourced ingredients on restaurant menus and the great craft beer, wine, and spirits produced here will keep us in discovery mode for a good while. On the shopping side, I’m always on the lookout for opportunities to add to my collection of crimson and gray-colored neckties.